The interim Davies report into airport capacity has named its three - or should that be four - most favoured options. Howard Davies has taken a moment or two out of his busy schedule as MTs hugely popular diarist to cogitate on the tricky issue of airport capacity planning, and has come up with his interim report today, a shortlist of promising projects from a which a final choice will be made in 2015. 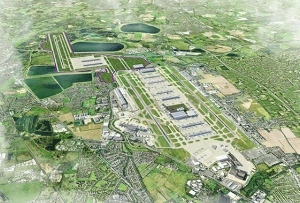 The ‘winner’ at this intermediate stage appears to be Heathrow, where two projects have been picked by the report. Thereafter comes Gatwick which is the last scheme ‘officially’ on the shortlist. But that isn’t quite all as special mention has also been made of the Mayor of London’s pet project, the £100bn giant super hub airport in the Thames Estuary. So rather like Schrodinger’s Cat, Boris Island isn't dead yet but it's not quite entirely alive either. ‘Under consideration’ is the official term for this limbo. A decision will be taken next year, says Davies, on whether it would be feasible and/or desirable to add it to the shortlist. At Heathrow the two schemes are the new Northern runway idea mooted by the airport’s owner BAA, which would involve demolishing 1,000 homes and relocating a stretch of the M25 for a cost of some £17bn. So far, so conventional. The other project is rather bolder, and was apparently originally suggested by former Concorde pilot Jock Lowe – chocks away chaps! It involves effectively tacking the new runway onto the end of one the existing ones, doubling its length to 6000m and then using one half for takes offs and the other for landings. This apparently is neither as dangerous or confusing as it sounds – probably just as well. It would also be further west and thus less noisy. The final scheme to make the cut is a third runway for Gatwick costing up to £9bn. Gatwick is running at 85% capacity and has proved, says Davies, popular with passengers and airlines alike. Expansion at Stansted has been ruled out, because it has plenty of spare capacity in its existing configuration, he says. Likewise Birmingham, which will have to be content with HS2 as a consolotion prize. So that all sounds eminently sensible, and Davies can enjoy his Christmas break happy in the knowledge of having delivered a pragmatic and politically adroit first report. But the battle of Boris Island is unlikely to go away – London’s bombastic mayor has a track record where defending projects with his name attached is concerned.